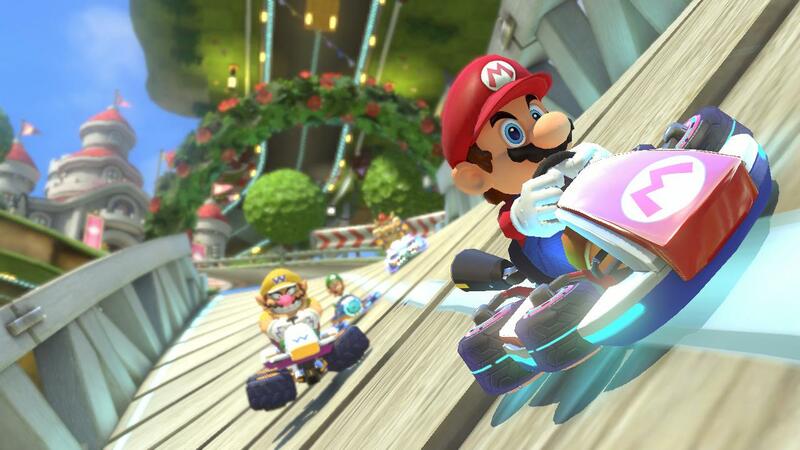 Nintendo’s latest bid to generate more interest in the Wii U is an enticing one: Mario Kart 8. The long-running series has been a Nintendo staple since the first game debuted for the SNES console in 1992. The latest is the first one to arrive on Wii U — and, by extension, the first in the series to offer HD visuals — and it sure is a looker. Just check out our review if you want the full rundown. That’s not what we’re here to talk about. Now that the game is out, we figure you might be looking for some help. A lot of what’s been established over the past 22 years remains the same, but there are some notable changes. Not to mention new features. All of this means you’ll need to come up with some new strategies for victory. Read on to get a little boost off the starting line. As we said already, certain things in Mario Kart 8 work just like they always did. Chief among those is the speed boost at the start of a race, which you get if you hit accelerate at just the right time while you’re waiting at the starting line. It’s pretty simple once you get the hang of it. A Lakitu floats in on a cloud before every race with a light box that ticks off the three-second countdown to the start of the race. You want to hit accelerate as soon as the second of the three lights flares up (at the two-count). Do it too early and you’ll spin out and lose a few precious seconds at the start of the race. There’s a comfortable window here, so just make sure the second light is live and hit the button. Then, when the timer reaches zero and the race begins, you’ll rocket ahead of anyone that wasn’t able to pull off the boost. Also back is the Power Slide technique. As with previous Mario Kart games, if you press the button to hop while steering left or right and keep the button held down after you land, you’ll enter into a drifting Power Slide. You’ll know you’ve done it right if sparks appear behind your kart. There are two levels of speed boost connected to Power Slides, signaled by the color of the sparks behind your kart: blue, then orange. Blue sparks appear after you slide for a few seconds, then orange appears a few seconds after that. To use the speed boost, simply let go of the jump button once you see blue/orange sparks. You can also speed up the color changes by quickly wiggling your steering left and right while you’re in a slide. It’s a tricky maneuver, but it’s worth learning. 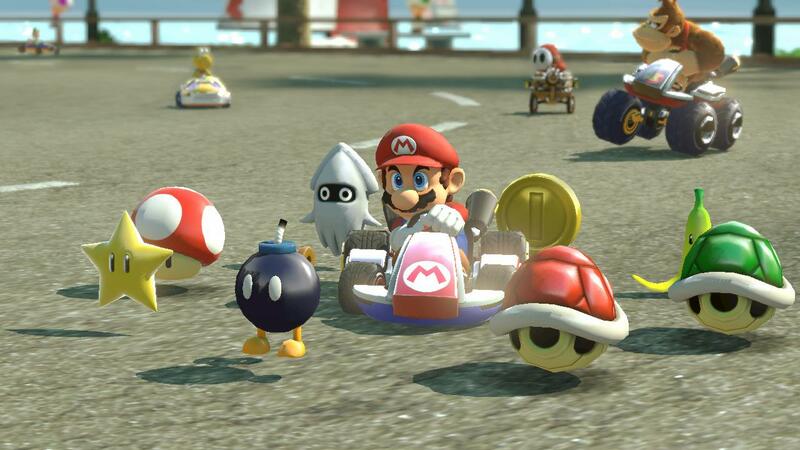 Coins aren’t new to Mario Kart 8, but they haven’t appeared in every game. The ones scattered around each course as collectibles serve a few different purposes. For one, each coin you collect gives you a small, immediate speed boost. Each one also raises your kart’s top speed, up to 10 coins worth (there’s a counter in the bottom-left corner of the screen). Note, however, that each time you’re hit by certain hazards (such as lightning), you lose some of those coins. Collected coins also feed into Mario Kart 8‘s unlockables. Each one you grab — whether or not you’ve got a full set of 10 put toward your kart’s top speed boost — counts toward a master total, with unlockable vehicle parts automatically added to your stock for every 50 collected, through 1,000 coins, and then for every 100 collected after that. The most effective way to boost your coin supply is to play local multiplayer games. Each human player that collects a coin adds to your own overall total. So while you might not want your competition to be getting speed boosts and whatnot, it’s always helpful to encourage all of your fellow players to grab coins. Note as well that the Coin item that you get from Item Boxes isn’t just useful for adding to your total. The minor speed boost that you get from it is also enough to help when you start losing control. Hang onto the Coin item when you get it, then use it as you’re coming out of Power Slide or a bad turn to immediately correct your kart’s course. Power Slides and coins aren’t the only speed boosts you can go after once a race is underway. If you hit the jump button at the precise moment you catch air — whether it’s a proper jump or some environmental hazard — your racer will get a mid-air speed boost as he or she performs a trick. There’s also drafting in Mario Kart 8, a technique adapted from real-life racing. The idea is to get behind another racer and sit in their slipstream for a few seconds. You can tell you’re doing it right if you see the air around them distort a little bit. Stay there long enough and you’ll get a speed boost from the decreased aerodynamic drag on your own kart. Brand new in Mario Kart 8 is the ability to switch to a zero-G mode for certain sections of track, during which your wheels leave the road and your kart turns into a hoverkart. Controls remain fundamentally the same in zero-G; there’s no strafing, Power Slides continue to work, and so on. However, you can nab a new “Spin Boost” by colliding with another racer or with certain obstacles on the track. Both racers get the Spin Boost burst of speed, but the “attacker” has the advantage in that he or she can plan ahead to bounce in a favorable direction while sending the struck opponent speeding into the wall, or off the course entirely. This only works in zero-G areas, which are triggered whenever you drive over a blue-glowing strip on the track. Look for these strips on various courses, as they often give way to alternate routes. Item Boxes are the great equalizer in any Mario Kart game. The simple formula is as follows: the worse you’re doing in a race, the better the stuff you’re going to get. That’s not always true. It’s possible to be in last place and still get, say, a banana peel. But you’re much more likely to get a lightning bolt or blue shell. Before we run through the full list of Item Box boosters, it’s worth mentioning one significant change in Mario Kart 8. In earlier games, it was possible to trail certain items behind you, such as banana peels and green/red shells, by holding the button down, then collect a second item. You can still trail items behind you in this new game — and that’s a useful strategy for blocking incoming red shells, same as it ever was — but doing so no longer frees you up to collect another item. 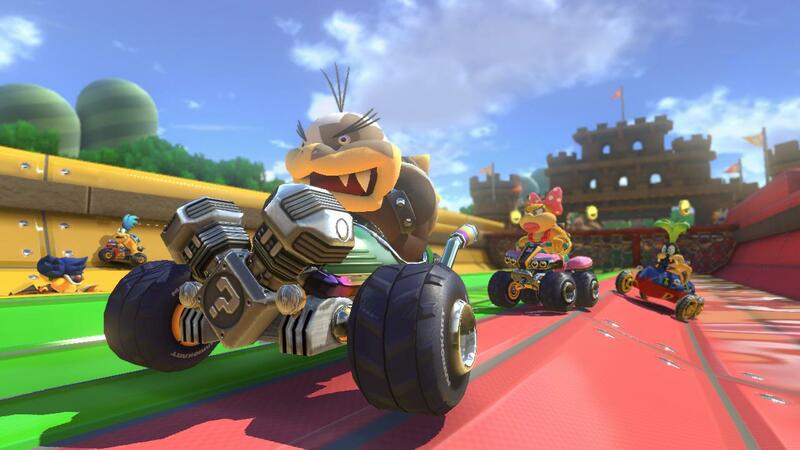 You’ve got to actually use the item you’ve got before you can grab a new one in Mario Kart 8. Banana Peel: These come in single and three-peel varieties. The single peel can be dropped behind you or thrown ahead of you as a trap — throw it by holding forward on the steering stick as you use the peel — or it can be trailed behind you to block incoming projectiles. The three-peel alternative creates a rotating shield of bananas that circle your kart until dropped, thrown, or collided with by a projectile or another racer. Green Shell: The dumb-fire projectile of Mario Kart games. Like banana peels, these come in single and three-shell varieties. Use a collected green shell to fire it straight in front of you, or hold down on the steering stick as you fire to shoot it behind you. You can also trail it behind you to block projectiles. The three-shell version circles your kart like a shield, but otherwise operates exactly the same. Red Shell: Red Shells, available as single shell and triple-shell pick-ups, home in on the nearest target (even if they’re in the air or underwater). They otherwise work exactly the same as green shells. Coin: It’s a coin. Use it and it’s like you’ve picked up a coin off the track, giving you a brief speed boost and correcting your course if you happen to be caught in a turn. 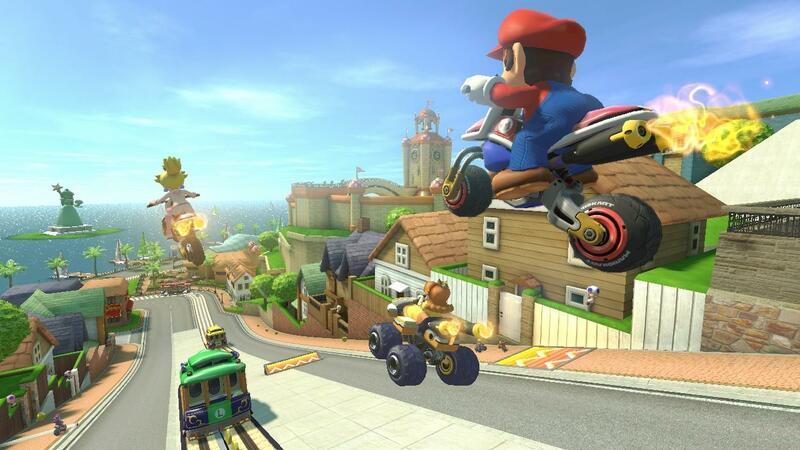 Super Horn: The Super Horn is brand new in Mario Kart 8. It’s a handy little device that, when used, emits shockwaves that repels other nearby racers and incoming projectiles. Even Blue Shells. This is the most powerful pick-up that a first-place racer can possibly get; if you’re winning and you happen to get one, hang onto it until you’ve got a Blue Shell bearing down on you. Mushrooms: Mushrooms provide a decent speed boost when they’re used. The triple mushroom pickup gives you three such boosts, though take note: triple mushrooms circle your kart in the same way that shells and banana peels do. If an opponent collides with one of them, they effectively steal your boost. Don’t be reckless, and wait for one boost to finish before you use the next one, but use triple mushrooms as quickly as you can when you have them. Golden Mushroom: Much like the regular mushroom, the golden variety gives you a speed boost when used. What sets them apart is the fact that they’re not immediately consumed when you use them. Golden Mushrooms are on a timer, meaning you can spam the “use item” button until it disappears from your item tray. Be careful though; the speed boost is very helpful on straightaways, but using it on tight turns can end up costing you time. Fire Flower: This projectile weapon is similar to the Golden Mushroom in the sense that it’s on a timer. Once you start using it, you can spam fireballs until the item disappears from your tray. These fireballs — which can be thrown in front of you (default) or behind you (press down on the steering stick as you fire) — work similar to hazards like banana peels and shells, in that any racer hit by one immediately spins out. Star: The Star item works just like it has since the very first Super Mario Bros. game, providing temporary invincibility for as long as your racer flashes. It also gives you a top speed boost for the length of the invincibility. Blooper: This little squid is a real pain for everyone but the person who uses it. Fire one off to spray black ink across every other racers field of view for a short period of time, effectively blinding them. The distraction is usually enough for a lagging driver to move forward a few places. Bob-bomb: Drop this adorable little bomb behind you or throw it in front of you to disrupt the race for anyone caught in its blast. Piranha Plant: Using this item attached a Piranha Plant to the front of your kart that automatically seeks out and chomps down on any nearby racers or obstacles. Use it when you’re behind and pulling in close to the pack. Even better if you use it just as you catch a drafting boost off of someone in front of you. Boomerang Flower: The Boomerang Flower can be thrown three times before it expires (forward or backward), and it can hit multiple racers in a single throw. It otherwise works like any other projectile, causing struck racers to spin out briefly. Bullet Bill: Similar to the Chain Chomp of previous Mario Kart games, the Bullet Bill items briefly turns your kart into the Super Mario enemy it is named for. While in this form, you get a boost of speed, auto-steering, and invincibility. It’s basically a ticket to move up a few spots in any race. Lightning Bolt: The devastating lightning bolt returns once again in Mario Kart 8 to annoy everyone but the lucky jerk that grabs it (usually close to or in last place). Use it to slow down and shrink any racers in front of you, all the way up to the first-place racer. Shrunken racers can be squashed by certain hazards, slowing them down even more. Blue Shell: The most devastating projectile in the game… if you’re in first place. The Blue Shell has homing capabilities that make it similar to the red shell, save for the fact that it targets whoever’s in first place. It can hit other racers on the way to its ultimate target, but it’ll always continue forward until it takes out the number one driver. The only counter is the Super Horn. Crazy 8: Much like Mario Kart 7‘s Lucky 7 pickup, Crazy 8 gives you an assortment of items to use, with all of them circling your kart (in the same way that three shells/banana peels/mushrooms do). Seven of the eight items are the same as they were in MK7: Green Shell, Red Shell, Banana Peel, Mushroom, Blooper, Bob-bomb, and Star. The eighth item is a Coin.